Learn about music instruments and letters in a fun and interactive game! Featured on Apple's Best apps for Ages 5 and Under. This top educational app for kids offers a brand new musical learning experience, as they learn the alphabet and expand their vocabulary through music! • Your child will learn to recognize a flute, saxophone, trumpet, trombone, bass, vibraphone, drums and many more instruments by sound and sight. • Audio recordings of real acoustic instruments from professional musicians. • Put your knowledge to the test with our games : "Find the instrument" and "Which instrument starts with (ABC)?". • We added an auto play option! Now you can view all letters in order - great for young ones and special needs learners! • Take a picture with the jazzy kittens and share your photo. • This app will teach and inspire your child to start playing a musical instrument. Check out JAZZY 123, A JAZZY DAY and JAZZY WORLD TOUR for more educational fun with the Jazzy Cats! • We added an auto play option! You can view all letters in order - great for young ones and special needs learners! 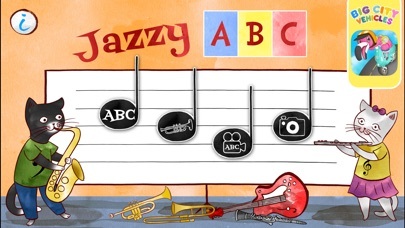 • FREE Jazzy ABC iMessage sticker app comes with each download! If you are enjoying Jazzy ABC, make sure to check out our apps: Jazzy 123, A Jazzy Day and Jazzy World Tour, Big City Vehicles.